498841. Anonymous. Circa 215-212 BC. Æ Aes Grave As (39mm, 67.04 g, 12h). Post Semi-Libral standard. Rome mint. 507558. L. Saufeius. 152 BC. AR Denarius (18mm, 3.60 g, 5h). Rome mint. 506277. Aurelius Rufus. 144 BC. AR Denarius (21mm, 4.06 g, 4h). Rome mint. 506275. Anonymous. 143 BC. AR Denarius (18.5mm, 4.15 g, 2h). Rome mint. 506290. Ti. Veturius. 137 BC. AR Denarius (18.5mm, 3.96 g, 12h). Rome mint. 489988. M. Aburius M.f. Geminus. 132 BC. AR Denarius (21mm, 3.89 g, 3h). Rome mint. 506282. P. Maenius Antiaticus M.f. 132 BC. AR Denarius (19mm, 3.94 g, 11h). Rome mint. 506289. M. Vargunteius. 130 BC. 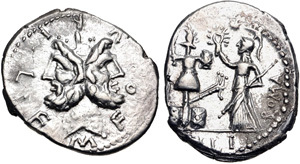 AR Denarius (21mm, 3.95 g, 4h). Rome mint. 507557. M. Furius L.f. Philus. 120 BC. AR Denarius (19mm, 3.93 g, 8h). Rome mint. 506287. Q. Titius. 90 BC. AR Denarius (18mm, 3.90 g, 12h). Rome mint. 490073. L. Marcius Philippus. 57 BC. AR Denarius (18mm, 3.83 g, 12h). Rome mint. 506099. M. Plaetorius M.f. Cestianus. 57 BC. AR Denarius (18.5mm, 3.84 g, 5h). Rome mint. 496981. Q. Pomponius Musa. 56 BC. AR Denarius (18.5mm, 4.03 g, 6h). Rome mint. 503246. Q. Pomponius Musa. 56 BC. AR Denarius (18mm, 4.02 g, 6h). Rome mint. 504225. Q. Pomponius Musa. 56 BC. 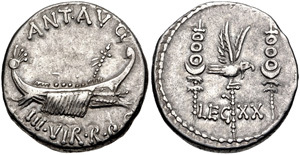 AR Denarius (18mm, 3.81 g, 2h). Rome mint. 506104. Moneyer issues of Imperatorial Rome. L. Livineius Regulus. 42 BC. AR Denartius (18mm, 3.73 g, 12h). Rome mint. 506876. The Caesarians. Julius Caesar. April-August 49 BC. AR Denarius (18mm, 3.80 g, 3h). 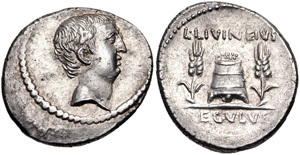 Military mint traveling with Caesar. 506877. The Caesarians. Julius Caesar. March-April 44 BC. AR Denarius (19.5mm, 4.11 g, 6h). Rome mint; M. Mettius, moneyer. 498851. The Triumvirs. Mark Antony. Autumn 32-spring 31 BC. AR Denarius (16.5mm, 3.85 g, 7h). Legionary issue. Patrae(?) mint. 505927. The Triumvirs. Mark Antony. Autumn 32-spring 31 BC. AR Denarius (18mm, 3.40 g, 6h). Legionary type. Patrae(?) mint.